For over 17 years, national headliner, Erik Myers has been entertaining audiences with his high energy machine gun delivery and trademark voice. His accounts of bad nights, bad jobs, bad dates and bad Uber rides keeps the crowd begging for more. Erik has a 1-hour special on Hulu entitled “Dopeless Romantic”, and has been seen on Laughs on Fox, Gotham Comedy Live on AXS TV, Comics Unleashed on CBS and Showtime. 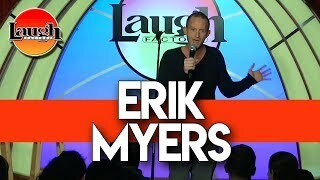 He recently co-created the hit cartoon ‘Court Ordered’ and can be found leaving audi view more..
For over 17 years, national headliner, Erik Myers has been entertaining audiences with his high energy machine gun delivery and trademark voice. His accounts of bad nights, bad jobs, bad dates and bad Uber rides keeps the crowd begging for more. Erik has a 1-hour special on Hulu entitled “Dopeless Romantic”, and has been seen on Laughs on Fox, Gotham Comedy Live on AXS TV, Comics Unleashed on CBS and Showtime. He recently co-created the hit cartoon ‘Court Ordered’ and can be found leaving audiences in stitches at the top comedy venues across the nation.